iDRIVE TV - Snapchat Updates – Snap Maps: GPS Sharing or Ghost Mode? Home Blog Snapchat Updates – Snap Maps: GPS Sharing or Ghost Mode? Snapchat Updates – Snap Maps: GPS Sharing or Ghost Mode? In the past few years, Snapchat has become one of the most commonly used phone applications in the U.S. and around the world. There are one hundred million daily active Snapchat users, whether they’re posting pictures of food on their stories, sending selfies to their friends, or keeping streaks and raising their Snapchat scores (Omnicore, 2017). Millions of users feel safe and comfortable on this popular app–especially teens: research shows that 75% of American teenagers use Snapchat (NORC at the University of Chicago, 2017). The unique appeal of Snapchat is that pictures that are sent to friends within the app will self-destruct after a few seconds of viewing them. 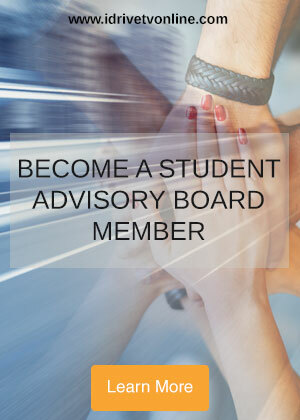 It is not surprising that teens love this feature! It proves for an entertaining and worry-free way of talking to friends, as there is little chance a full conversation could be saved or shown to other people. Plus, users are notified if their snaps are screen-shotted. The app now has features like sharing Snapchat “stories,” reading fun daily “magazines” from sites like Buzzfeed, Mashable, and Cosmopolitan, a variety of creative filters which change every day, as well as the satisfaction of keeping a hundred day streak. It’s easy to see that Snapchat has successfully created a huge network of faithful users who engage in the app daily and use it as a primary method of communication. Some even choose Snapchat over texting. Not only are users entertained and fulfilled, they also feel comfortable and safe when using the app. However, the recent Snapchat update raises some safety concerns that may cause some to reconsider their privacy when using the app. This summer, Snapchat launched its new Snap Maps; a feature where users can see a map where everyone’s Bitmojis show up at their exact physical location. A Bitmojis is, as advertised by the online service, “your own personal emoji,” that you can dress up and customize however you like. When several Snapchat users are hanging out together, the map shows their Bitmojis together in a circle. 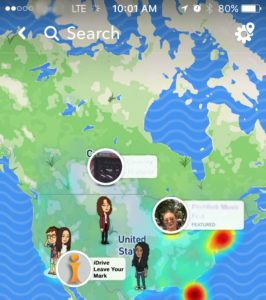 The map also shows cartoons that resemble other real-world activities: Bitmoji characters wear headphones when a Snapchat user is listening to music and shows the Bitmoji in a small yellow car if a Snapchat user is in a moving vehicle. The map also highlights “hotspot” areas. Scroll around the world to peruse Snapchat stories that offer a quick peek into global and local events like fairs, concerts, and other gatherings. Do Snap Chatters Have Control over Snap Map Settings? The answer is yes: Snapchat settings allow you to adjust who can see your Bitmoji location on the Snap Map. Click “My Friends” to enable all the people you have on your Snapchat friends list to see your location. Click “Select Friends” to choose which people with which to reveal your location, or go into Ghost Mode so that no one can see your location on the Snap Map. The Snap Maps update amplifies matters of personal safety. Even if you only let your Snapchat friends see you on the map, the possibility exists that someone that you befriended–either in person or online–might use social media in a way that creates trouble for you or puts you in harm’s way. Consider Roni’s story. How might you adjust your settings to prevent someone like Danny from knowing your location? Take screenshots of your stalker’s Snaps as evidence to show law enforcement if you need to file a police report. Cyberstalking has been a concern long before the Snap Maps feature, or even Snapchat, existed. In her article for Wired.com, Roni Jacobson, a freelance journalist, writes about her 15-year experience with a stalker that she calls “Danny” (2016). Danny cyber stalked Roni since she was the mere age of twelve. Roni recounts how the relationship begins: frequent Facebook messages escalate into obsessive harassments that include threats to herself and her friends. As Roni attempts to block the stalker on Facebook, “Danny” creates new usernames and continues to intimidate and degrade her. Danny sends complaints about Roni the FTC and FCC, threatening her career as a journalist, and he sends vile messages to her friends pretending to be her. Read more about Roni’s experience here. Consider the unique features of Snapchat in a situation like Roni’s: a stalker could send disappearing photos and videos. Moreover, if a user allows everyone to view his or her location on Snap Maps, cyber stalkers, like Danny, would be able to gain access to their targets’ exact whereabouts, thus putting the victim’s safety in even more jeopardy. Location-sharing is not exclusive to Snapchat. Social media platforms that share GPS location could amplify risky situations such as cyber bullying, stalking and harassment, and lead to real-world harm. Google Maps also has a “share location” option. 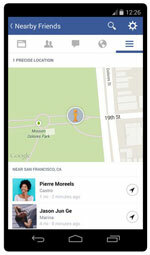 You can choose how long you’d like your exact location to be available to your friends. If the location-sharing feature was active on Roni’s Facebook account, Danny might have been able to track her down. Why the Alarm Over Snap Maps? The alarm that Snap Maps has generated is possibly due to the fact that millions of Snapchat users are teens who use social media with “real world” friends, form new friendships and even dating relationships through social media. 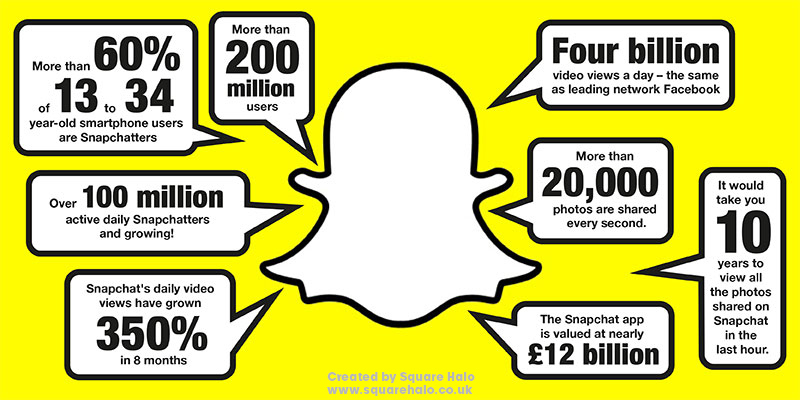 According to Statista, 60% of Snapchat users are ages 13-24 (2017). Despite Snapchat’s age limitation, you probably know of some people under age 13 who use the app as well. Although location-sharing presents safety risks for teens and adults, this feature is more troubling if users are minors. Cyber-stalking is a problem that has troubled people since the widespread adoption of digital communications. (add space) This issue is not only a nuisance, it may be considered a crime. Stalking takes on many forms, and the definition of stalking differs in state laws. Some states count stalking as a crime as long as the victim experienced fear, while other states require that fear of death or bodily harm is involved. 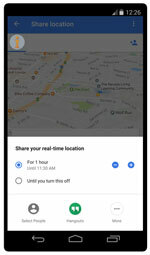 Whether you are using Snapchat, Facebook, Google, or any other application with a GPS feature, you have the option to manage who sees your location. It is up to you to safely decide if you want to share your GPS location with friends on social media, or whether you want to turn off location sharing completely. If you are considering turning on location sharing for the “Just Friends” option, make sure you consider how well you know each of the people on your friends’ list. Some people are only connected on Snapchat with their closest friends, while others accept acquaintances, internet friends, or anyone who goes to their school. Think safely and logically when making these choices, and make sure to help your younger siblings, and friends who may not know better, to make smart choices as well. Are you unsure as to whether you are sharing your GPS location with the public? Visit your Snapchat, Facebook, Google, or other social media accounts and check your GPS settings in order to make sure your that you aren’t sharing your location with the entire world. On a side note, you can also keep the app from tracking your every move by turning the location feature off when you are not searching for your friends. Consider only turning on location-sharing when absolutely necessary. What can you do if someone is stalking you online? Block and report the stalker to the online service. Save screenshots of communications that you receive from the stalker (including messages, photos, and videos). Keep a digital copy, if possible, of all communications so that law enforcement can identify the IP address (Internet location) of the cyber stalker. Stalkers may try to hack your account, so change your passwords and remove personal details like GPS and contact information. If you feel that you are in immediate danger, report to the police immediately. Do you use the GPS feature on Snapchat or other social media accounts? Have you ever had a cyber stalker? What did you do? Get into the conversation with iDrive on Instagram! “Crime Type.” Bureau of Justice Statistics. BJS, n.d. Web. 11 July 2017. https://www.bjs.gov/index.cfm?ty=tp&tid=3. “U.S. Snapchat Users Demographics 2016.” Statista. N.p., 2017. Web. 2 July 2017. https://www.statista.com/statistics/326452/snapchat-age-group-usa.